By Margaret Ann Smith, Ph.D.
ost commonly, anthropologists focus on the differences between various ethnic groups. In this essay, I would like to break from tradition and focus on the traits that the various tribes from the Xingu River Basin have in common. In many ways, the territory occupied by the inhabitants of the Xingu (pronounced “Shin-goo”) River area can be considered one sole nation because of the close relationships between the various tribes despite speaking different languages. The Xingu Indians for the most part have the same beliefs and superstitions, similar feasts and ceremonies, and are similar in essence and form. In addition, they all have essentially the same cosmology and religious concepts. Interestingly, rites of passage are practically the same in all villages, despite different ethnologies. There is even a strict psychological and temperamental similarity among the members of the various villages of the Xingu Indians (Xinguanos). Anthropologists commonly refer to the original natives of Brazil as silvícolas, indigenes, íncolas, aborigines, Amerindians and even Brazilindians. In Brazil, there are four main linguistic groups: Tupi, Macro-Ge (Jê), Carib (Karib), and Arawakan (Aruak). All four language groups are represented in the Xingu River Basin. The Xingu region is occupied by fifteen different tribes that speak eight different languages. How this variety of people and languages came about in the first place is unknown as little research has focused on their migration. In any case, the Upper-Xingu region became a refuge of different indigenous populations from various geographic points that despite pressures from outside influences have managed to maintain their cultural integrity. There are two main concentrations of Indians in the Xingu, those of the upper river and another population center located about half way down the river. In the upper part are the Waurá (Aurá), Mehináku (Meináco) and Yawalapiti (Jaulapiti) tribes that speak Arawakan dialects, the Awetí (Auetí) and Kamayurá (Kamaiurá) speaking a Tupi language; and the Kalapálo, Kuikúru, Nauquá (Nahukuá), Matipuhy (Matipu), and Ikpeng (Txikão) who speak languages of the Carib linguistic branch. Below, in the area of the Von Maritius Waterfall are the Kayapó (Txukuhamai or Txucarramãe) and Suyá (Suiá or Beiço-de-Pau) who speak languages in Macro-Ge linguistic family. Slightly above near mouth of the Maritsauá-Mitau River, the Jurúna (Yuruna or Yudja) speak a Tupi language while the Trumaí tribes speak a language isolate, unrelated to any known language family. The Kayabí (Kaiabí), who are thought to have come more recently from the distant Tapajó region, speak a dialect of Tupi as their general language. With exception to the Kayapó and Suyá who are nomads and hunter-gatherers, all the other Xingu natives are sedentary, primarily practicing agriculture and fishing. The crops that they cultivate are the same as before the arrival of Columbus. They include manioc, corn, yams and potatoes as the principal crops. In addition, perennial cotton is also cultivated. In particular, Kayabí agriculture is quite impressive. In addition to the above species, the Kayabí cultivate giant yams on a large scale as well as the mangarito (a type of tuber), red potatoes, and twelve different cultivated varieties of peanuts. In general, the native of the Upper Xingu have a basic diet consisting of manioc and fish. For the most part, they do not eat any meat besides fish and even then only certain varieties of fish are consumed. Generally they only eat fish that have scales and reject those without. With respect to birds, there are only two or three species that are consumed, the curassow, jocobins and guan. Older men (principally the shamans) are said to eat a lot of pepper in order to enhance their powers. The principle food of the Xingu Indians is manioc which is most commonly consumed in the form of tapioca cakes (beiju). Manioc is harvested from the fields, grated and then refined. The unrefined manioc is poisonous and must be leached with water to remove the toxins. With respect to harvesting wild fruits, there is an incredible variety available in the rainforest, some poisonous and some edible. The Xingu Indians say that one can tell which is edible by observing monkeys and only eating fruits that they consume. Xingu Indian villages are generally well adapted to their environment. Xinguano villages are typically spacious, built on solid foundations that is free from floods, and often strategically positioned out of the reach of mosquitoes. The dwellings (long houses) are also spacious, often measuring 25 meters long and 15 wide. The roof is generally made of straw rather than palm leaves. Each long house has two doors, each on opposite sides of the dwelling. Each hut is constructed around an extensive common area. All feasts and ceremonies are held in the common area. In addition, Xingu Indians usually bury their dead in the commons directly in front of their homes. The long houses are not inhabited by unit families, rather by groups of relatives. The hammocks, which are made by women, are woven of native cotton mixed with the fibers of palm tree sprouts. Hammocks are hung around the outer part of the house so as to leave the central area a free space. Each long house has one chief or head that is responsible for the economic activities of the group. The chief of the house is the one who leads the others in the fields, chooses the place, oversees the cleaning of the land and proceeds with the planting. 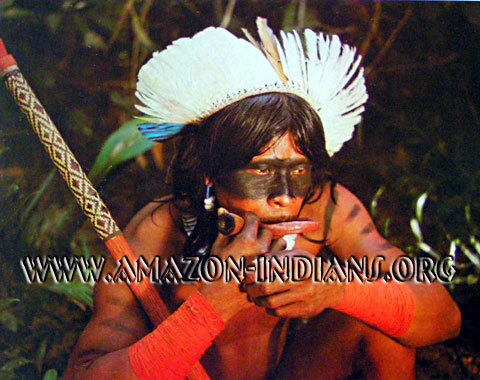 In contrast, the general chief (cacique) of the village has little physical control over other inhabitants of the village. His primary role is to sponsor ceremonial rites. The cacique, with consul from the village shaman, talks to the whole village, inviting them for ceremonies, directing the preparations of the agricultural fields, arranging trade, maintains the tribal traditions of the village. Each morning the cacique speaks to the entire village from the doorway of his hut while holding a bow and arrows in his hands. The power of the cacique is very limited as each member of the tribe acts for himself. No one determines what an individual should do. Each Xingu Indian is a free and independent man. It is the force of culture and tribal traditions that maintain the unity of the village and tribe. 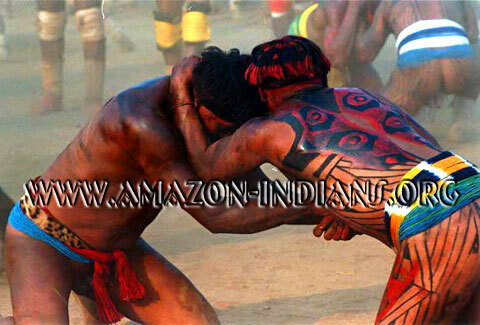 Xingu Indian men do not recognize the authority of any cacique to impose penalties and punishment. Xinguano men learn early in life as boys what their position within the community is and they begin to act like an adult at an early age. When a Xinguano attains the age of twelve, he is very knowledgeable about what his responsibilities are and about the traditions of his people. The manner in which Xingu indigenous parents raise their children is somewhat unique in that, generally they do not punish their children. They respect them and treat them as adults giving them much responsibility. In return, Xingu children for their part respond well and do not misbehave. According to a Xingu Indian story, a child once started a fire that burnt down a house. Although the loss was great, no punishment was given to the child. When the father was asked why he did not punish the son, he responded with surprise, “Why? He is only a child. What would punishing him accomplish?” From that point on, the Xingu natives called him Conomét Aratá (Fire Boy). The above story illustrates just how different Xingu tribes are from western societies. The first thing that I noticed when I first visited the Xingu Indigenous Park Reserve is that everyone was happy. It seems that very little makes them unhappy and that they spend about half the day laughing. 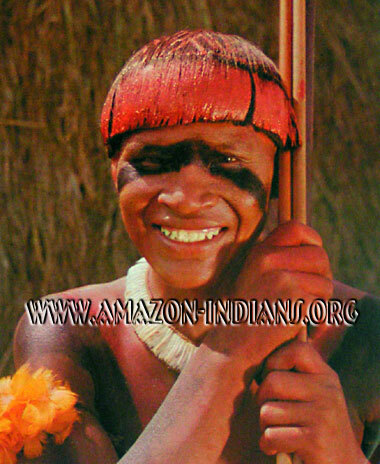 The native of the Xingu are always joking and laughing. Not surprisingly, outsiders with their foreign ways are often the subject of their jokes. For example when I first arrived in the Xingu Indigenous Park, the chief put a feathered crown on my head. Little did I know that I would be the source of great amusement and jokes. During my first journey to visit the Kayapó and Suyá tribes of the Xingu River area, I was told the story of how a Brazilian governmental official from Brasilia arrived in a Xingu tribal community to meet with three chiefs and wanted to give them a present. All he had was a bar of soap. The official took out a knife and cut the soap into three equal pieces, giving one to each chief. Later when the official was leaving, he asked for an arrow as a present. One of the chiefs took one of his arrows, broke the arrow into three pieces and gave one of the pieces to the shocked Brazilian official. The Xingu Indians communities, irrespective of their tribe or language, all share similar traditions. For example with respect to marriage, there can be no consanguinity; marriage between relatives is taboo. Marriages are arranged by the parents when a girl attains the age of two or three years; at which time she is promised to a boy of about twelve. 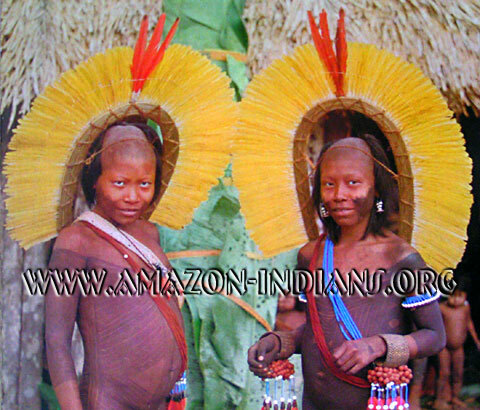 The reason for this difference in age is logical as Xingu women generally have a shorter life span than the men. 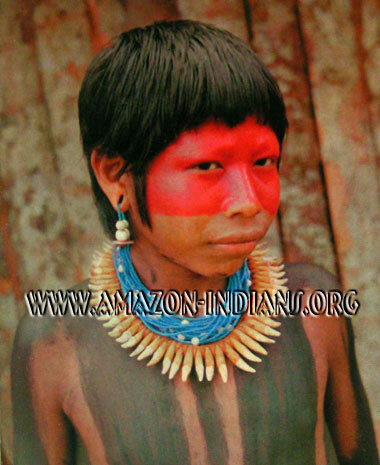 When a young Xingu girl attains puberty, she undergoes a process similar to that of the Ticuna Indians who are located thousand of kilometers away. After her first menstrual period, she is isolated to a corner of the hut where she is put into an enclosed space remaining there until her hair bangs grow down to her chin covering her face. During this period of isolation, she can only be visited by relatives, and she does not speak out loud, only whispering. Even baths are taken in this enclosure. For the duration of the isolation period, she is educated by her mother and relatives about marriage and her responsibilities as a wife and as an adult member of the Xingu community. During the marriage ceremony, the girl sits on a small stool in the village center and her bangs are cut to her eyebrows, thus symbolizing her rebirth with a new vision of the world as an adult. After marriage, the husband lives with his in-laws and helps them for about a year. After this period ends, he can return to with his wife and child to his own house or to his village. 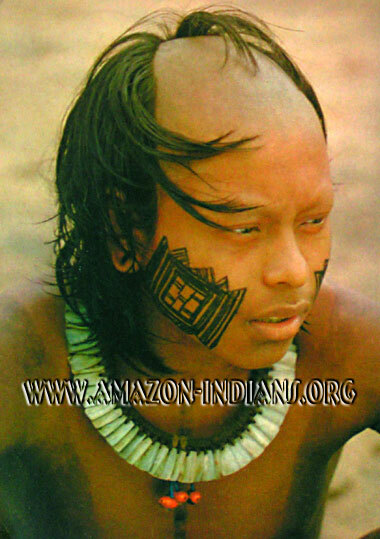 Xingu Indians believe that the spirit of the paternal grandfather returns in the form of the first born son. This belief explains the immense respect that the father has for his first son, as his son and father are thought to be one. Curiously, when the child is ill, medicine is also given to the grandfather. The division of labor between men and women is quite distinct. Spouses do not invade the other’s territory, and personal objects are strictly private. Women make ceramics such as pottery. Consequently according to Xingu Indian logic, it is also her job to go after water, since she made the pot in which it is carried. Men and women work together in collective fishing expeditions. The men are responsible for making the wooden fish traps, while the women and children help in collecting the fish and baking them. However when bows and arrows are used to fish, it is exclusively a male activity. When salt is made, only the women participate. Women gather the leaves of pond lilies and dry them in the sun. After drying they are burned they process they filter the ashes to obtain a potassium chloride salt (potash) in contrast to sodium chloride. Trade between villages is formalized in a ceremony call the moitará, a Kamayurá word for trade. Men trade among other men, and women among other women. Interestingly the men’s trading is well organized, quiet and follows recognized rules. In contrast, the women’s trading is confusing, noisy, and seems completely disorganized. The women haggle over prices, while the men have fixed values for their trade items. Items exchanged include ceramics, necklaces, belts, feathered adornments, weapons, flutes, canoes, hammocks, fishing nets, baskets, salt, spices, foods and even animals. Before the formal trading ceremony begins, the men participate in huka-kuka wrestling matches. The ceremony of Kuarup (Kwarup or Kwarip) is a Xingu ceremony honoring the dead. The name of the ritual comes from the Kamayurá language, but is intertribal in nature as the participation of different Xingu tribes commonly takes place. Kuarup is considered as a symbol of the Upper Xingu region, both by the various tribes of the Xingu and by outsiders. Basically, Kuarup is a funeral ceremony. However, it is much more, and involves Xingu myths of creation, Xingu hierarchical classifications, the initiation of pubescent girls into Xingu society, and the reinforcement of alliances between the various Xingu tribes. According to Xingu cosmology, the first humans were made out of wooden logs by the Creator by blowing tobacco smoke over them. The Creator also attempted to bring them back to life after their deaths and failed. The irreversibility of death is commemorated in the ceremony of Kuarup, with the trunks of the wooden logs serving as symbol of the deceased. 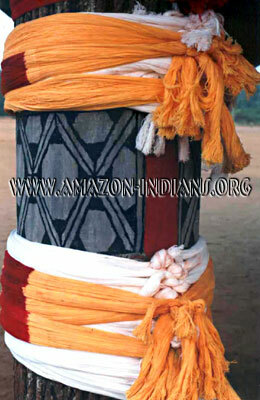 The Kuarup trunks are painted and decorated with feathers and male belts. The trunks become the focus of the Kwarup ritual with the inhabitants of the host village keeping wake over the tree trunks, weeping for the dead. An important part of Kuarup is the huka-huka wrestling matches. Opponents face each other, imitating the grunting of the jaguar. Matches are brief, often lasting a few seconds, and end when one of the opponents is thrown to the ground. A representative of the host village confronts an adversary of each invited village, one at a time, beginning with matches of their champions and ending with novice matches. The invited villages do not wrestle among themselves, only with opponents of the host village. The decorations of the Kuarup trunks are given to the winning wrestlers. After the huka-huka wrestling matches, one of the girls who was formerly in puberty isolation gives pequi (Caryocar brasiliensis) seeds to the chiefs of each one of the invited communities. At the same time, a representative of the same village removes the waist belt (uluri) of the girl. The uluri is a small triangular ornament worn just above the pubic region. The act of removing the uluri belt has a very apparent sexual connotation, as Xingu women have sexual relations without their uluri belts. The seeds of the pequi fruit also have a sexual connotation in that the smell of the pequi is said to be similar to that of female genitalia. In addition, the seed is a symbol of reproduction. The seeds will create new plants, just as the girls will reproduce and create new human beings. A feast then takes place after which the Ritual of the Flutes is performed. During this ritual, uruá flute-players play giant flutes as they dance accompanied by pubescent girls who have just come out of isolation. The girls still have uncut hair covering their eyes to prevent them from seeing the sacred flutes. The girl places her hand on the uruá flute player’s shoulder and the duo dances throughout the village. The Kuarup Ceremony of the Dead ends with a final farewell of the invited guests. The cycle of life has been reenacted with birth being connected to death. Most importantly, the relationships between different Xingu tribes and communities have been reinforced and their traditions perpetuated. If you would like to discover how you can meet the Xingu Indians and find out how you can assist them with the preservation of their traditions and culture, please email Dr. Smith at masmith@amazon-indians.org. The author, Dr. Margaret Ann Smith, is an anthropologist currently working as an associate with the Movement in the Amazon for Tribal Subsistence and Economic Sustainability (MATSES), a nonprofit association that is helping indigenous people of the Amazon preserve their culture and lands in a independent and sustainable manner.